Director On Call — Funeral Home Answering Service Has Received Our 17th Award for Excellence! Funeral Home Answering Service Has Received Our 17th Award for Excellence! Director On Call was presented with the exclusive 2016 CAM-X Award of Excellence for the 17th year at CAM-X Convention and Trade Show held September 20th-23rd 2016 in Quebec City, Quebec at the Chateau Laurier. It was a special event because our President Brad French also received the Tom Ryan Award for Ethics, Integrity and Quality. The Award of Excellence is presented annually by the Canadian Call Management Association (CAM-X), the industry's Trade Association for providers of call centre services including telephone answering and message delivery. 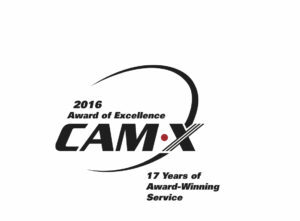 "27 years ago, CAM-X introduced the Award of Excellence to the Call Center industry as a tool for independent assessment of the quality of service delivery. We are so pleased that Director On Call has proven its commitment to excellence by its participation in this program, and are delighted that they have earned this prestigious award." says CAM-X President Michael Leibowitz. Now a seventeen-time winner Director On Call earned the Platinum Plus Award! "I would like to congratulate our Team for winning this award yet again. The desire to give superior service to all of our callers is demonstrated time and again." says Brad French.